Will ESDC consider terrorism/security issues--and would Ratner build an under-arena garage? Does Forest City Ratner still plan to build a parking garage--a tough-to-defend terrorist target--under the proposed Brooklyn Arena, the keystone of the Atlantic Yards plan? If not, where would arena parking go? And will the state Empire State Development Corporation (ESDC) consider security and terrorism issues when it produces a Draft Environmental Impact Statement (DEIS) for Atlantic Yards? It's possible, based on the available evidence to be discussed below, that the developer no longer plans a garage under the arena, that additional parking may be planned offsite near public transit, and that the state review will be forced to confront the terrorism issue. If not, expect some major conflicts over these issues. Some context about consultants AKRF, who have worked on projects ranging from Shea Stadium to Battery Park City. Obviously large developers value AKRF's work, but a frequent critic is Richard Lipsky, whose Neighborhood Retail Alliance lobbies for local businesses over big boxes and large developments. In a post on his blog, Lipsky wrote, "The AKRF folks are simply rationalizing their job which is to make a great deal of money by minimizing impacts and conducting dishonest research." In another post, Lipsky deemed AKRF "accommodating consultants" and "trained in the abject aping of its master’s whims." But don't expect Lipsky to challenge AKRF's work on the Atlantic Yards project. He backs the development, despite Forest City Ratner's track record of bringing national chains to its Brooklyn properties. Lipsky, according to an 11/14/05 profile in the New York Observer, is getting paid by Ratner to organize an amateur sports league at the proposed Brooklyn arena and to do other lobbying for the developer's projects. Lipsky generally opposes projects that require eminent domain, but told the Observer, "If it was bringing in big-box stores or displacing other retailers, we might have different feelings." An arena that can seat 18,000 to 20,000 people, even at one of the city's busiest mass transit hubs, would require associated parking, as would a significant amount of residential units--initially projected to be 4,500, now 7,300. At least that's what Forest City Ratner concluded in its early plans for the project. The first set of press releases, in December 2003, announced 3,000 underground parking spaces (1,100 for the arena + 1,900 for the housing development to the east), as noted in these architectural sketches . The 2/18/05 Memorandum of Understanding between the developer and city/state agencies, shows underground parking beneath both the arena and housing (see p. 18 of the PDF), and describes how tax-exempt bonds would finance both the arena and "the on-site Arena garage" (see p. 6 of the PDF), which would apparently be under the building. Since then, however, it's gotten murky. The 9/15/05 draft scope issued by the ESDC describes 4,000 parking spaces, including 2,100 to be built in the first (arena + surrounding towers) phase. It acknowledges: The study area has a very limited parking supply, and thus, the proposed project anticipates providing a substantial number of new spaces. But the draft scope, prepared by the developer's consultants, does not specify that the parking would be underground. It does state that one challenge is to "assess the potential impacts associated with proposed parking facilities." Does Forest City Ratner still plan an under-arena garage? Company spokesperson Lupe Todd did not respond to four queries. Staffers at Brooklyn Borough Hall also wouldn't answer that question (though they responded to others). However, comments on the draft scope submitted by Borough President Marty Markowitz hinted that, given the parking crunch, more parking areas would be needed outside the proposed footprint: For arena events, however, the distribution of structured parking, particularly those near transit services, within at least approximately one mile should be estimated and analyzed. Council of Brooklyn Neighborhoods (CBN) secretary Jim Vogel commented, "There is no definite parking garage in the current plan as put forward by the developer, as far as we can tell. Until we can see exactly what is proposed there is nothing definite to respond to. As we have said by way of our statement of support for the new NIST [National Institute of Standards and Technology] guidelines, underground parking is problematic from a security point of view." One solution, as Cohn observed, would be to try to prevent parking on neighborhood streets--a further incentive to use mass transit. At a Borough Board hearing on traffic and parking earlier this month, there was much discussion about the need to encourage use of mass transit, but there was no mention of the onsite garage. Then again, a report in Oculus, the magazine of the American Institute of Architects New York Chapter, on Frank Gehry's late November appearance in New York, described "3,900 below-grade parking spaces." Do the architects know something the rest of us don't? Security gets short shrift in the ESDC's draft scope. One of the tasks, Task 5, addresses "Community Facilities and Services," including police and fire protection, schools, libraries, day care, and health care needs. The ability of both the police and fire departments to provide fire protective services for a new project usually do not warrant a detailed assessment under the state process, the document states, "only if a proposed project would affect the physical operations of, or access to and from," the fire and police stations. Thus the draft scope does not propose detailed analyses of police and fire protection for the largest project in the history of Brooklyn. Note that Forest City Ratner has previously downplayed the cost of increased police and fire protection, though the city Independent Budget Office observed that "costs to the city for policing the new Nets arena could be significant." Rather, for Task 5, the draft scope proposes analysis of public schools, libraries, health care facilities, and day care centers. That emphasis drew criticism from the CBN, which pointed out that Engine Company 219/Ladder Company 1 at 494 Dean Street abuts the project site, and the 78th Precinct at 65 6th Avenue is less than two blocks away--and both would be affected by construction, street closings, and traffic. Even Markowitz's submission to the ESDC said that "the impact of the induced traffic on emergency services should be assessed." Contrary to the project sponsor’s assertion, a full and detailed analysis of fire and police protection impacts must be performed. The project will result in the permanent loss of city streets, street and lane closures throughout the next decade, the removal of 2 bridges, the removal of excessive amounts of construction and demolition debris, the delivery of an excessive amount of building materials and the delivery and regular use of heavy construction machinery and equipment. Taken together, these impacts will prove a substantial impediment to mobility and access in an area that is already notoriously among the worst for baseline traffic conditions and pedestrian safety. Without question, the sheer size and duration of the project will directly affect the fire and police departments’ abilities to respond to emergency calls. Failure to analyze the project’s impacts on fire and police protection in detail will place our communities at an unacceptable and avoidable risk. CB8 noted security concerns: Prior to the 9/11/2001 attack, a plan to destroy the Atlantic Avenue station was fortunately thwarted. Because of the real possibility of another incident on American soil, special attention needs to be paid to security concerns related to international or domestic terrorism. Recently released Department of Homeland Security's 15 National Planning Scenarios, covering both natural disasters and domestic or foreign attack, reveals that over half of these scenarios apply to the BAY project. Among the possibilities: Truck bombs and/or car bombs entering, or just passing by, the BAY complex. CB8 also asked about parking: Will parking in underground lots be restricted during arena events given the example of how parking has been restricted at the US Tennis Open in Queens? How might such parking restrictions impact traffic & thus impact evacuation and rescue operations as well as the local economy? Was security discussed at the Borough Hall meetings aimed to provide input on the draft scope? Borough Hall spokeswoman Regina Weiss responded: On November 29, safety and security issues were discussed during the meeting of the Brooklyn Borough Board Committee on Atlantic Yards regarding community facilities. Representatives from the FDNY and NYPD advised the committee that they will be reviewing the plans for Atlantic Yards to make sure that all security concerns will be addressed. I wasn't there, but CB2 district manager Robert Perris said the above description was "a fair summation of the discussion on the topic of security," though "To the best of my recollection, no aspect of security was discussed in detail." Security issues beyond Task 5, "Community Facilities"
Because the draft scope doesn't include a separate section on terrorism, the meetings at Borough Hall haven't considered it. But the CBN, in its voluminous written testimony to the ESDC, stated: The EIS should include a section on Terrorism because the project site would meet several criteria that define a terrorist target of opportunity: a prior terrorist attack, the city’s third largest transit hub, a major sports arena, location under a La Guardia Airport flight path, the height and limited setbacks of buildings, and the large numbers of people living, working and visiting the site. CB2 also commented to the ESDC: The EIS should include, to the degree that this is possible, discussion about the review by the New York Police Department of the project as a possible terrorist target. Transportation hubs and places of public assembly are documented potential targets. The most recent redesign of the “Freedom Tower” clearly indicates that there is a public interest in, and a public policy for, such a discretionary review. Indeed, Bernard A. Tolbert, chief of security for the National Basketball Association, said in 2003: "While some of the security concerns like crowd control, scalpers and unruly fans have always been considerations, we now find ourselves looking at issues like potential suicide bombers, the vulnerability of heating and air conditioning intake systems, vehicle bombs and food supply chain safety." Security analysts Christinia Cope and Alan Rosner warned in a July 2005 white paper that requirements for vehicle searches would cause "widespread traffic jams and extreme delays throughout downtown Brooklyn." Rosner, at the ESDC hearing in October, also asked that the scope be expanded to require that the NYPD (with the Deparment of Homeland Security) examine this project just as they did Ground Zero. See more coverage of security issues at NoLandGrab. In October, Develop Don't Destroy Brooklyn commented to the ESDC that another arena site, notably Coney Island would be safer: Given the obvious concerns for traffic and security from terrorist attacks, to name a few, there are clearly alternative locations for the arena that may mitigate those impacts. Expect more questions, and more discussion, especially when FDNY & NYPD provide the reports requested by Borough Hall. However, the Borough Hall meetings are a shadow to the ESDC process, and the bigger question is whether the revised scope, and the subsequent Draft Environmental Impact Statement (DEIS), will address security and terrorism issues with the seriousness required. 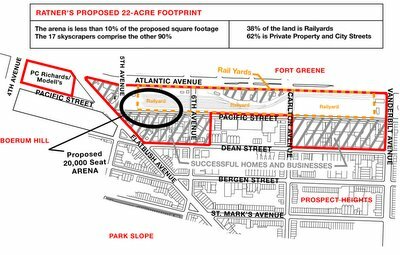 The arena (and Atlantic Yards project) would NOT be built "over the railyard"
Why is this significant? Because developer Forest City Ratner cannot complete its 22-acre project simply by building on the 8.3-acre railyard (for which it has purchased development rights) and must purchase private property--and quite likely ask the state to condemn other properties via eminent domain. By contrast, the Extell Development Company's rival proposal to the MTA would have used only the railyard, conforming to the community-developed Unity Plan. That's not to endorse Extell, just to point out that they are very different proposals. So what should the press do? I suggest using the shorthand "on and around the railyard" or "over and around the railyard." It doesn't require much more space, and it's far more precise. It's misleading to suggest that the project or arena would be built "over" the railyard. Errol Louis on black leadership: should Roger Green be the model? In a 12/21/05 column in the black-oriented Our Time Press, headlined Atlantic Yards and the Obligations of Leadership, Daily News columnist Errol Louis deems three black elected officials failures because they haven't followed state Assemblyman Roger Green's lead in negotiating the Community Benefits Agreement (CBA) with Forest City Ratner. The rest of the area’s political delegation – Councilwoman Tish James, Congressman Major Owens and State Senator Velmanette Montgomery – has either tried to kill the project outright or mounted endless attacks on it. That’s no way to bring economic prosperity to an area that’s desperate for it. In almost any other big city – Atlanta, Chicago, Detroit and Washington, D.C. come to mind – black pols understand the critical importance of positioning black businesses and professionals to benefit from big public-sector projects. In the 1970s, for instance, Maynard Jackson, Atlanta’s first black mayor, worked tirelessly to ensure that black companies got a slice of the contracts associated with the building of the city’s airport – and succeeded in putting millions in the pockets of black entrepreneurs, which in turn helped build a solid black middle class. As noted, most but not all of the groups endorsing the CBA are Brooklyn-based, but the minority-owned engineering firm that will oversee air monitoring and safety requirements during asbestos abatement at several buildings is based in Staten Island, and the minority-owned plumbing company that will disconnect water and sewer lines to the buildings is based in Queens. As for some other minority-owned firms, as noted, it's not clear how much engaging them encourages systemic changes. Construction firm McKissack and McKissack is already doing pretty well; it has offices in New York and Philadelphia, but its web site defaults to Philadelphia, so it's not exactly local (though local subcontractors will be hired). Ismael Leyva Architects and lighting consultant Domingo Gonzales Associates are based in Manhattan and already seemingly thriving (and, if we're counting ethnicity, Latino). The Terrie Williams Agency, also based in Manhattan, seems to be doing well. 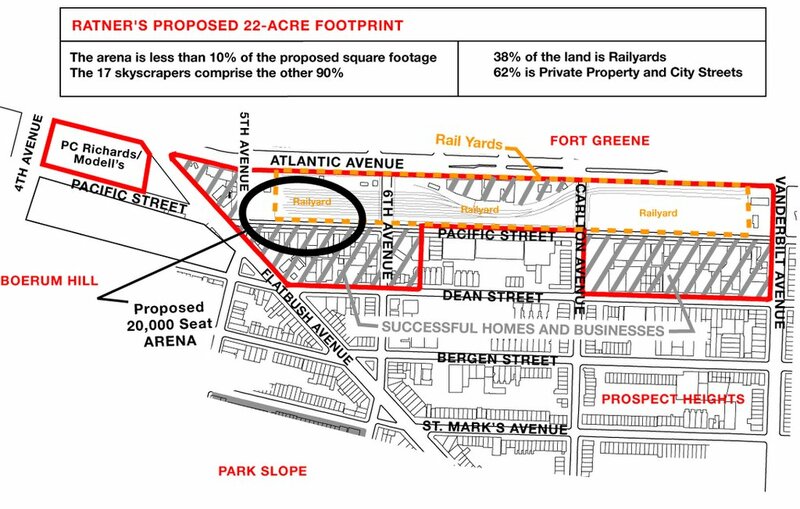 Atlantic Yards, unlike any of the other listed development projects, already has a publicly stated, legally binding community benefits agreement that promises hefty percentages of the project’s dollars and jobs will go to minority- and women-owned businesses and local residents. At this stage of the game the question should be how and when the dollars will begin flowing into central Brooklyn. Green has been diligent about getting and staying at the bargaining table, negotiating commitments for local businesses and residents – but far too many of the other local pols just don’t get it. Many have wasted two years trying to shrink or kill Atlantic Yards rather than fight to get the biggest possible slice of the multi-billion-dollar project channeled to local businesses. Perhaps more importantly, though, is just how many jobs will go to the poor, black neighborhood residents who live on three sides of the project site. The Brooklyn document sets up a hierarchy whereby public-housing residents get first dibs on spots in a job-referral program and a construction-job training program. But the agreement sets no numerical targets for how many local people will get jobs. The agreement doesn’t mention the 400 jobs Forest City expects to bring when it moves the Nets basketball arena from New Jersey, which Mr. Stuckey said will be subject to union rules and may be filled with current employees. Nor does the agreement mention jobs in the proposed hotel, which would also be subject to union rules, Mr. Stuckey said. That leaves the construction jobs, about 1,500 of them over the next 10 years. The agreement sets a goal of employing 35 percent minorities—a reasonable and achievable threshold which Forest City has met on its other projects. In other words, 525 jobs—not reserved for public-housing residents, or even residents of Crown Heights and Bed-Stuy, but for minorities from all over the metropolitan region. Green has been diligent about getting and staying at the bargaining table, in Louis's words? It's a little deeper than that--Green had previously gained support from Forest City Ratner, as noted in Chapter 4 of my report, and a former top aide left to work in community affairs for the developer. Perhaps James, Montgomery, and Owens are looking at the larger picture: a project that would cost the public well over $1 billion over 30 years deserves scrutiny rather than simply a search for a share--and relatively small share, considering the number of jobs and amount of low-income housing--in central Brooklyn. Footnote: Louis doesn't mention that he was once a potential candidate, along with Letitia James, for the City Council seat won in 2001 by James E. Davis. [I originally wrote that he and James ran for the seat, but Louis pointed out to me in a followup e-mail that "I never officially declared, never formed a campaign committee, circulated no petitions and was enrolled in law school weeks before Primary Day. In other words, I did not run for council in 2001." OK, but others thought he was running. The Courier-Life chain reported 6/25/01 that Louis had "dropped out of the 35th Councilmanic District race, citing an array of reasons for his decision." City Limits weekly, in a 6/4/01 article, reported that Louis had lost an endorsement to James: Errol Louis, co-founder of Bedford-Stuyvesant's Central Brooklyn Federal Credit Union, dropped his race for City Councilmember Mary Pinkett's seat last week. The cost of campaigning this year, said Louis, just didn't add up. Although he won 30 percent of the vote in his 1997 race for the seat, he had only raised about $15,000 to date. "You have to really, really want to do it," he said. The 12/18/05 New York Times Real Estate section article about Prospect Heights, "A Neighborhood Comes Into Its Own," didn't mention the parent New York Times Company's connection to developer Forest City Ratner--they are partners in building the Times Tower in Midtown. I critiqued the article previously; here I'll explain why I think it should've included the Times/Ratner disclosure, even though it's a close call. The Times has consistently disclosed the Times/Ratner business relationship in its recent Metro section news coverage of Atlantic Yards and in its editorials. As noted in Chapter 10 of my report, the Times did not do so consistently in its early coverage of the impending project, including articles in the Sports section. Nor did the Times do so in some positive Real Estate section articles about other Forest City Ratner projects--relevant since they border the proposed Atlantic Yards and also reflect the developer's track record. Nor was there disclosure in then-architecture critic Herbert Muschamp's rhapsodic 12/11/03 essay ("Courtside Seats to an Urban Garden"), which later provided Forest City Ratner with quotes suitable for a p.r. mailer. Current critic Nicolai Ouroussoff, by contrast, did disclose the connection in his 7/5/05 essay ("Seeking First to Reinvent the Sports Arena, and Then Brooklyn") in response to the latest architectural drawings. Muschamp, as noted in Chapter 14 of my report, also failed to disclose that he served on a committee with Forest City Ratner executives (Bruce Ratner and Jim Stuckey) that helped choose the architect for the Times Tower. Such disclosure decisions are judgment calls, so what's the standard? Calame added that "it appears to be an unusual lapse"--a judgment with which, as noted above, I disagree with somewhat. So back to the recent Real Estate section article. Why require disclosure in an article in which only three of 32 paragraphs concern Atlantic Yards--plus another paragraph mentioning the developer? Because, on balance, I think the Times should err on the side of more disclosure, rather than less. That article on Prospect Heights will be cut out (or printed out) and read by many a house- or apartment-hunter, some perhaps new to the city or to Brooklyn. Anyone moving to Prospect Heights should know that Atlantic Yards, the biggest project in the history of Brooklyn, would have major ripple effects in terms of traffic, transit, and construction, among other issues that I think were underplayed in the Real Estate article. Anyone moving to Prospect Heights should be put on notice that the Times has a business relationship with Forest City Ratner, and that a search for information on the neighborhood should involve not only the Times but other daily and weekly publications. As stated in my report, there's no evidence that Times reporters have been told to go easy on Ratner; it's just that, given the business relationship, the Times should report exactingly, to dispel the spectre of a conflict of interest, and the Times has not done so. I don't think all articles that glancingly--as opposed to substantively--discuss Forest City Ratner deserve such disclosure. But this one does, especially since the article's offhand reference to the "stunning apartment building converted by the Forest City Ratner Companies" has such a rich backstory, unmentioned in the Times article.